Poor Alexander Parkes. When the British inventor created the world's first plastic in 1855, he probably didn't count on mankind developing a dangerous, 448-million-tonne-a-year addiction to the stuff. Not that plastic is, in itself, bad. It can be used to repair body organs. To build lighter versions of things such as car parts. To make dolls, Lego, Transformers and other memories of a happy childhood. All good uses of the substance. The frightening amount of disposable plastic being made (some reports estimate that around 40 per cent of the world's plastic is designed to be used once then thrown away)? Not so good, especially as more reports surface about the amount of disposable plastic entering our oceans and food systems. Then there's the issue of how long it takes for plastic to break down, with estimates ranging from 450 years to never. With an estimated 1 billion plastic-lined takeaway coffee cups used in Australia annually, the ubiquitous drinking vessel has become the pin-up boy of our disposable society. Some cafes are choosing to fight back by joining schemes like Responsible Cafes (customers bringing in their own cup enjoy discounted coffee) or switching to compostible cups. Others are simply reacting by not using takeaway cups at all. At Antz Inya Pantz in the inner Perth suburb of Vic Park, for example, customers have to either drink their coffee in-house, bring their own or buy a non-disposable cup. Since opening in May 2016, the cafe has removed 151,812 – and counting – takeaway cups from the system. 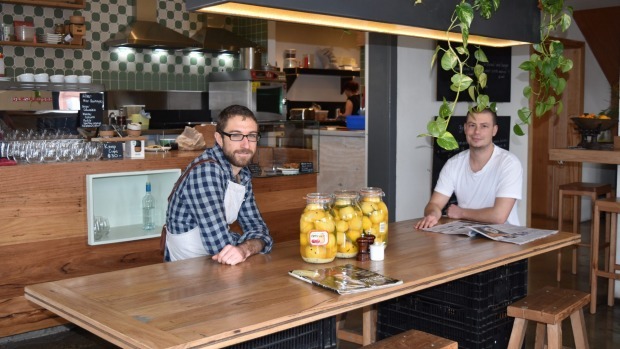 "In two years, I've had five people that wanted a takeaway coffee walk out of the cafe without listening to our spiel," says Antz Inya Pantz owner Craig Muzeroll. "Considering we serve around 400 customers every day, five people is a small percentage. People in Vic[toria] Park get it. They know we're a little eccentric." In Geelong, Little Green Corner is another striking blows against plastic, not least by working with local milk producer Schulz Dairy to have its milk delivered in metal pails that staff then decant into (reusable) glass bottles. "We don't save any money by not having packaging, but we're cool with that," says owner Hugh Whitehead. "It's an idea that fits in with our values about waste and that's good enough for us." Getting milk delivered in large-format containers is just the start of Little Green Corner's anti-waste stance. Rather than stock bottled drinks, the cafe makes its own seasonal drinks by combining (tapped) sparkling water with cordials and syrups made with seasonal fruit. Menus are kept tight with each of the four dishes offered a reflection of what local farmers have brought through the door.